A good friend who had been on several other Road Scholar trips encouraged me to join her. The company (previously named Elderhostel) caters to the 55+ crowd (pause) but she advised that if we chose an active trip, we’d be with a fit and lively group. Yellowstone was on my bucket list, I enjoy her company, and —accepting the fact that I am a “senior”— I agreed to go. Net-net: it was WONDERFUL. Really. OK, I have to give credit to the park itself. Yellowstone is an amazing geological and biological wonderland. 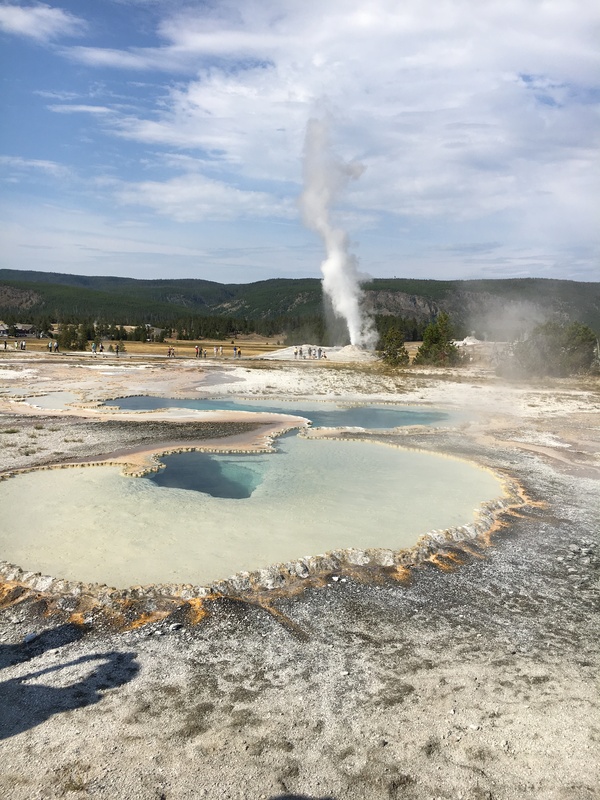 It is much, much more than Old Faithful…you are actually walking on top of an active super-volcano! Its vast expanse (2 million acres) has such environmental variety that you often think you have somehow landed in another park altogether…or that you have time traveled to either a prehistoric or post-apocalyptic time. Volcanic fields of geysers; hot springs, mudpots and steam vents; limestone terraces; a large river canyon with cascading waterfalls; hillside woodlands; and open fields with creeks and streams! And wildlife. Who knew? What added to my appreciation and wonder was having an expert scientist explain all the history, complicated natural processes, and unique events. Better yet was getting that information fed directly into my ear. Plus, you don’t have to huddle; you can walk ahead or linger behind and still stay involved. If you want less input or some quiet time, you just pull the ear piece out. But I didn’t. I was fascinated. I quickly stopped caring if I looked like a dork. With each visual feature there were details and context that made it come alive and (hopefully) stick in my mind. Here’s a partial list of my revelations: calderas and how they are formed, controlled burns for forest management, serotinous pine cones that only release at high temperatures, tending as the bison’s way of dating, heat-loving organisms called thermophiles that are as colorful as an artist’s palette, and the surprising source of travertine marble. Curious? Check these things out on the internet or book your own excursion to Yellowstone. And don’t dismiss group trips with audio-assisted guides. They are totally worth the nerd factor. Previous Article Remote Year? Yes and No! Yes, yes, yes…. and hovering at “elder”, which sounds even worse. Hello fellow-Road-Scholar-traveler! Your initial thoughts about traveling in a group like this really matched my own. Our Yellowstone trip changed it all for me. Looking forward to another RS jaunt. Thanks for sharing about it. Let me know your thoughts as you plan your future travel. I haven’t made up my mind yet about my next RS trip. So many choices, so little time! Wow: I always knew I wanted to go to Yellowstone, but honestly had NO IDEA of all the amazing visual treats and geological knowledge that went along with it! Your photos were simply breathtaking. Now you’ve whetted this nerd’s appetite even further. My bucket list is getting very full. Hope my pending trip up the Amazon proves to be as exciting. Stay tuned. Max, I was in the same same boat…had no idea how much is going on in Yellowstone. But don’t worry, it’s the AMAZON(! ), how could it NOT be exciting? I need to get out of my chair and take a walk in Yellowstone. Epic photos.